When I visited New York in the summer, we spent our last evening at Yankee Stadium in The Bronx and watched the Yankees beat Boston Red Sox. The game itself was entertaining, but just as fun was the selection of food. We had hot dogs with sauerkraut and pleeenty of nachos. 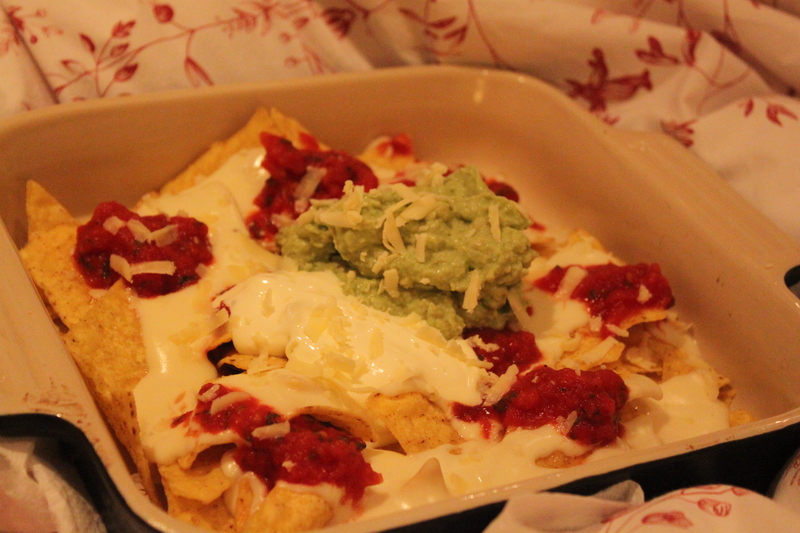 The way the nachos were served there with a cheesy sauce and not with melted cheese on top was delicious, especially with heaps of sour cream and guacemole and extra grated cheese. It is easy to make this at home too, and more substantial than popcorns while watching a film. And so yummy! Melt the butter in a non-stick saucepan, add the flour while whisking. Add some of the milk while whisking, and as it thickens add some more, while stirring the whole time. Repeat with all the milk. Once the sauce is thick, add the cheese to melt and season to taste with salt and pepper. Place the chips in a bowl/dish and distribute the warm cheese sauce. Top with the other ingredients. Dig in!